Aside from your home, you spend majority of your day at the office. It is your home away from home, which is perhaps the reason why you never stopped to think about how dirty it may be. Germs linger all around your work space, leaving you at risk to potential infection and illnesses. After this article, we can guarantee you will be breaking out the hand wipes. It doesn’t take a germaphobe to be grossed out by the amount of germs we’re exposed to daily in our offices. Some of the dirtiest places in your office may surprise you. Are you required to use a landline phone at work? Take a moment to consider how many people use that phone on a day-to-day basis. It’s no shock to us the amount of illness-inducing bacteria that can be found on the mouthpiece. Do you have a co-worker that spits when they talk? Guess what is right in their line of fire. To head off health hassles from bacteria and viruses, clean your phone daily with electronic-safe cleaners. Don’t be fooled! Cell phones are a germ safe haven as well! How often do you eat at your desk? Did you know that eating at your desk can introduce numerous bacteria onto your keyboard and desktop through crumbs and food particles? If that is not gross enough, consider the amount of times you have touched your nose, eyes, or mouth, then touched the keyboard. It’s no wonder that illnesses can spread through an office like wildfire! When we are sick, we discard our toothbrushes, clean our bed sheets and disinfect everything in the house to prevent the spread of the illness. Thankfully, we don’t need to toss our peripherals- keeping your keyboard and desktop germ free is just as easy. Wipe down your keyboard and desktop with disinfectant daily. Is your office in a one floor building? If so, feel free to skip this one as you’re likely safe from this haven of germs. Take a moment to consider the amount of people each day that press the elevator buttons. Where have all their hands been? Perhaps they were polite enough to cover their mouths from a sneeze just moments before and are now sharing it with the rest of the office by using the same hand to press the elevator button. You’d look quite bizarre disinfecting the elevator buttons every morning on your way up. That’s why we are suggesting you try to wash your hands immediately after reaching your floor. At the very least, avoid touching your face until you do so. Perhaps the most obvious and filthiest place of them all, office washrooms are home to countless germs everywhere you touch. Did you know that flushing a toilet creates and invisible spray of water and germs up to a metre in the air? Essentially, every time you flush an uncovered toilet, you are covering the nearby area in your “business”. No problem, washing your hands will remove all the germs, right? Sadly, no. Although you may thoroughly wash your hands, others may not. This means the remaining germs on their hands are being transferred via touch to the door handle, paper towel dispenser, and more. Now that you’ve been informed about all the nasty germs in the office and where they live, we wouldn’t be surprised that you’d want to learn how to control them. Electronic Safe Cleaners. Use electronic safe cleaners to wipe down any equipment in the office that could be home to germs. Equipment such as printers and phones that are used by multiple people should be wiped down at least one a day. Disinfectant Wipes. In addition to electronic cleaners, use disinfectant wipes to ensure all surfaces have been thoroughly eliminated of bacteria, viruses, and other harmful germs waiting for you to touch them. Practice Proper Hand Washing Techniques. 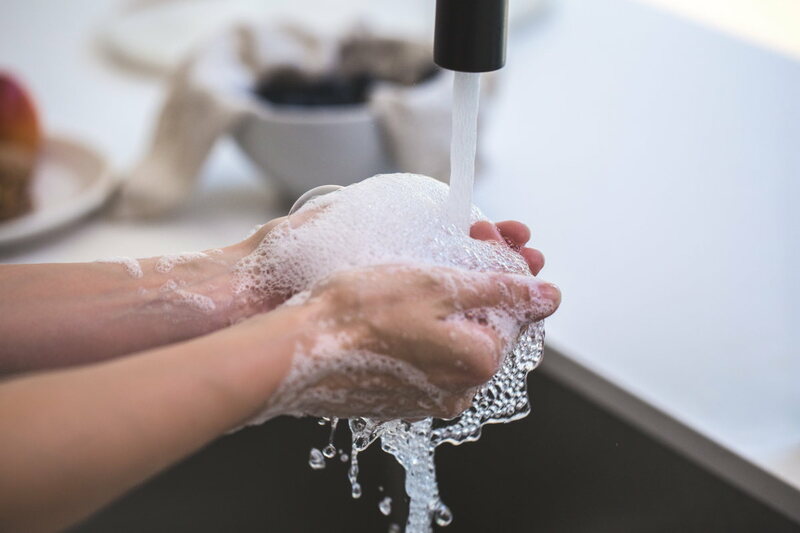 Handwashing is one of the easiest and best ways to protect yourself and your family from getting sick. Wet your hands with clean water, then lather them with soap. Scrub your hands for at least 20 seconds before rinsing (don’t forget to wash under your fingernails). Dry your hands with paper towel or an air dryer. Hire a qualified cleaning company – Okay, we’re obviously biased here, but the truth is the truth! Regular cleaning reduces infection, keeps offices healthy, and keeps the environment productive. Workplace Cleanliness… That’s Our Business! Are you interested in learning more? Read our post on on how workplace cleanliness influences productivity– you might be surprised on what you learn! Of course, it goes without saying that if you’re looking for a cleaning partner to take care of your commercial space, we’d love to hear from you!